Viking Alkyd and Acrylic Enamels - Epoxy Paint - Toll Manufacturing | Viking Paints Inc.
A series of medium speed air-dry enamels intended for spray applications such as refinishing trucks and other equipment. Easy to use with conventional spray equipment. 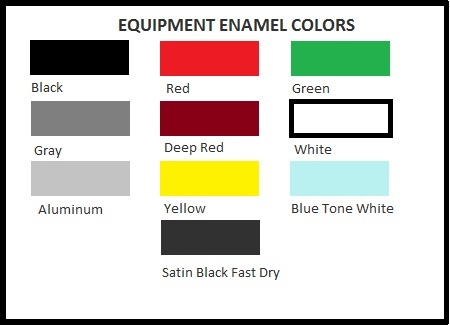 Viking Equipment Enamels are intended for application on trucks, implements, farm equipment, semi-truck boxes and cabs, parts and assemblies, OEM equipment, and many other uses. ECC-1400° is a superior, high temperature, coating. It was conceived and formulated specially for high temperature environments. When properly applied it will not flake, discolor, or promote rusting. It has been extensively dyno and field tested to 1400° Fahrenheit with excellent results. It is used for internal combustion engine exhaust systems pipe coatings, fire place mantles, BBQ grills, space heaters, and other environments where high temperatures cause discoloring, rusting, flaking, etc. Non-Lift Primer is a fast dry phenolic modified alkyd type, which contains corrosion inhibiting pigments. It can be top coated with virtually any finish coat including; alkyd enamel, acrylic enamel, acrylic lacquer and acrylic urethane.